Over the past summer, I had the opportunity to do fieldwork related to climate change and coral reefs in both Kiribati and the Marshall Islands. I’ve put together a slideshow that gives a window into the effect of rising sea levels and warming temperatures on these atoll countries, as well as the joys and challenges of the research. Click on the first photo and then the “i” icon in the top right corner to watch the slideshow with the captions. For more on what it is like to live in the Marshall Islands, I recommend listening to my student Sara Cannon’s interview with CBC’s Quirks and Quarks and reading her stories from the field. Sara spent the summer helping the Marshall Islands Marine Resource Authority with coral reef monitoring and some training programs. 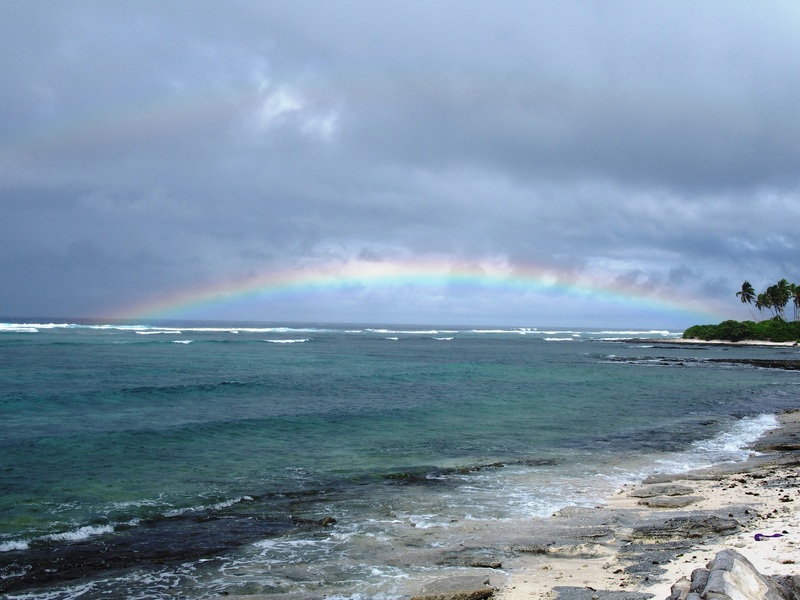 There are also a few dispatches from the Marshall Islands on this site. If you’d like to help, we are collecting used scuba and snorkeling gear, as well as books, to donate to people in Kiribati. For more on this effort, see here. 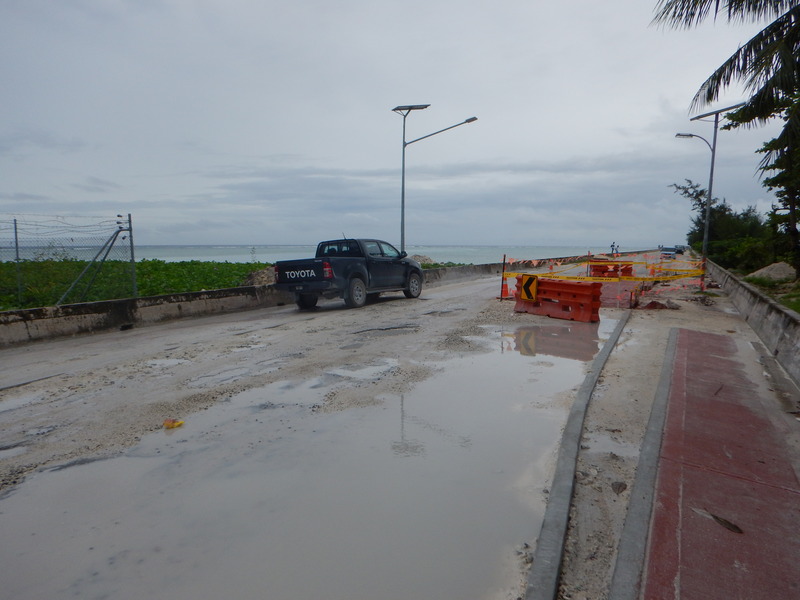 This is the fourth in a series of dispatches from our field work in the Republic of Marshall Islands. The geography of sports in the Pacific Islands is a bit of a lens into the colonial history and ongoing international power dynamics. There’s the rabid popularity of rugby in once-British Fiji. Then there’s the ‘export’ of football players from American Samoa, a U.S. territory where people are not granted U.S. citizenship and cannot vote for president. 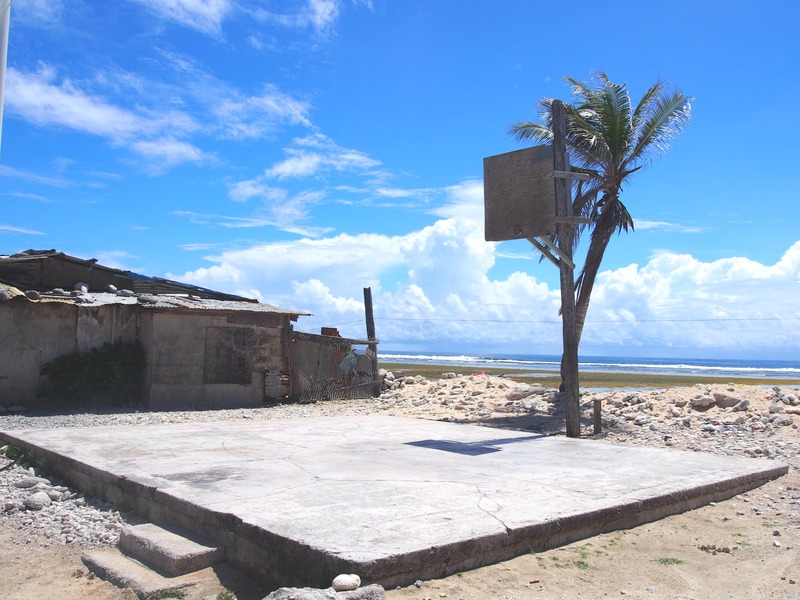 In the Marshall Islands, which has its own complicated relationship with the U.S., the sport of choice is basketball. 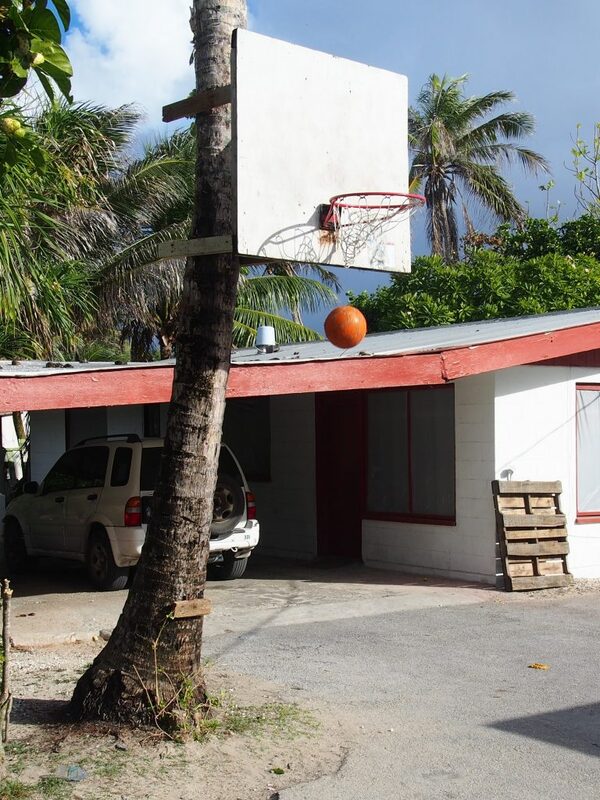 In the capital of Majuro, there are hoops attached to posts, palm trees, walls, you name it. There are quite a few well-maintained places to play, including the covered outdoor courts in front of the College of the Marshall Islands. However, many aging nets, hoops and backboards stay standing for years for the reasons described in my first dispatch: the challenge of getting new materials and disposing of waste on isolated reef islands. This is the third in a series of dispatches from our field work in the Republic of Marshall Islands. 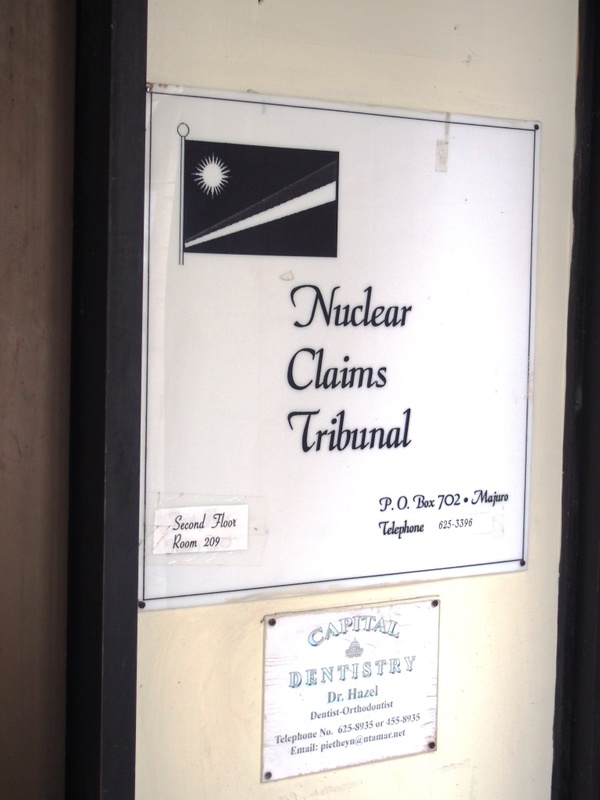 Across the road from the pier where we began each day in Majuro is a building housing the Nuclear Claims Tribunal. And a dentist’s office. The Tribunal was created in the 1980s as part of the “Compact of Free Association” with the U.S., which gave the Marshall Islands independence. 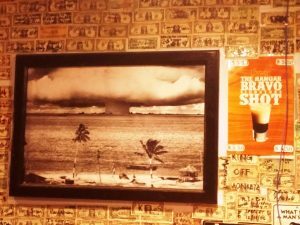 It was established to compensate the people and their families affected by the nuclear tests on Bikini Atoll in the 1950s. The story of the forced evacuation in advance of nuclear testing of Bikini is well known. 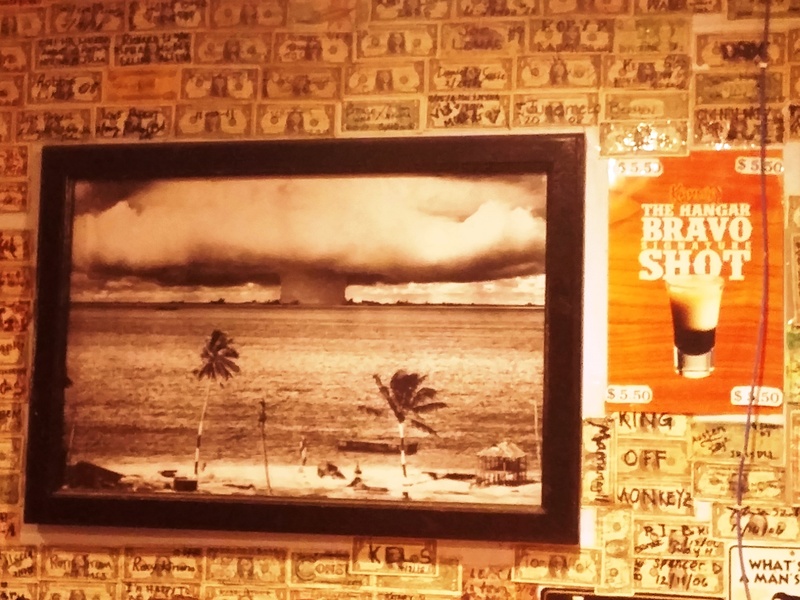 Today, the Bikinians and their descendants largely live on Kiji, a small crowded islet in Majuro, or in the U.S.
Less known, and even more odious, is the story of the people of Bikini’s close neighbour, Rongelap Atoll, a mere 75 miles away. The Rongelapese were not evacuated until 1954, days after the massive 15-megaton Castle Bravo test dropped fallout over the whole region. Three years later, they were told it was safe to return. They became test subjects in what was effectively a randomly controlled trial on radiation exposure. 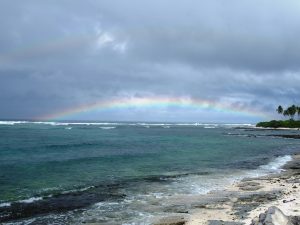 The Rongelapese were finally evacuated again in 1985, to two small islets in Kwajalein Atoll, home of a U.S. military base, by Greenpeace aboard the Rainbow Warrior. 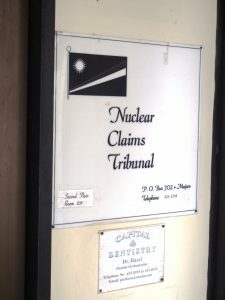 As detailed in the Rongelap Report, the fantastic and thoroughly depressing book by Barbara Johnston and Holly Barker, the Nuclear Claims Tribunal has awarded over $1 billion in legal claims. However, under the Compact agreement, the Tribunal was only allocated $150 million in compensation. The rest has gone unpaid. Some Rongelapese are still hoping to return home, depending on the health of the soil. Not the Bikinians, though. The Bikinians are worried about a new threat, also brought on by the rest of the world. Their adopted islet of Kili, along with much of Majuro, has experienced severe flooding several times in the past few years. 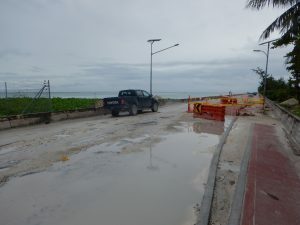 Concerned about sea-level rise, the Bikinians in Kili have asked about relocating to the U.S.
During our visit to Majuro Atoll, construction was ongoing to repair a stretch of relatively urban shoreline devastated by a storm last July. The waves and the damage from the July 3, 2015 storm were unlike anything local residents could remember. 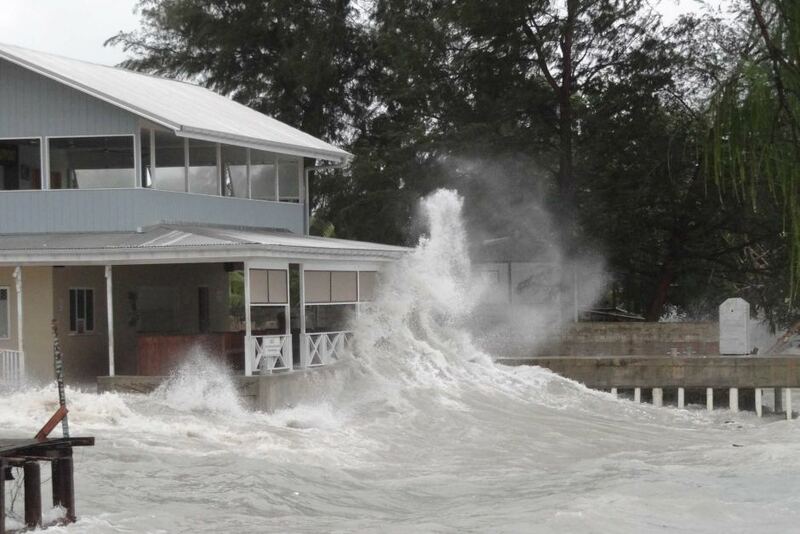 Westerly winds brought waves up to 10 feet high into the normally placid lagoon. Boats sunk, sea walls were torn apart, and houses were damaged, including that of Tony de Brum, the climate envoy who was pivotal in discussion of the 1.5 C temperature target at the UN Climate Summit in Paris. Did global warming and sea-level rise play a role? Most likely yes. How do we determine what counts as “climate” aid? As part of the United Nations (UN) climate agreements, the developed world has promised to provide at least US$100 billion per year by the year 2020 to help the developing world respond to climate change. The funding may come in many forms, from grants to private investments. There is one key stipulation: climate aid must be “new and additional” to standard development aid. What counts, and does not count, as climate aid is the subject of a new study (open access) by my colleagues Milind Kandlikar, Sophie Webber, and I. Accounting may not seem as glamorous as surveying reefs on remote islands, but it is just as important. If we want to help the developing world respond to climate change, we need to make sure any promised aid is actually being provided and meeting the priorities of the recipients.